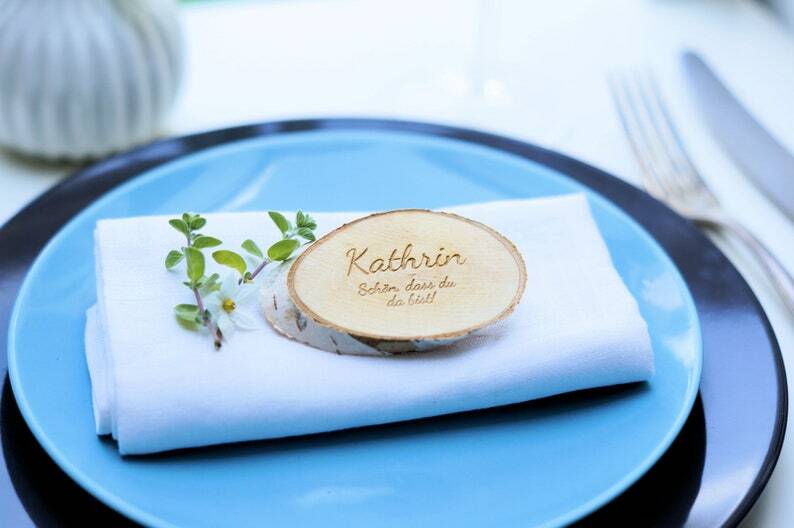 The names of your guests are engraved on small tree slices/birch slices. 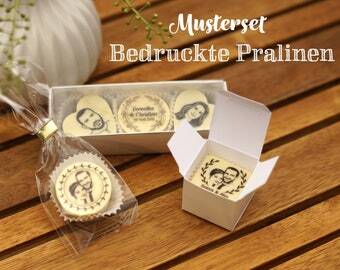 Alternatively, the names of the bridal couple as well as the wedding date can be engraved on the wooden discs, so that you can use the tree panes for example as Save-the-date cards. 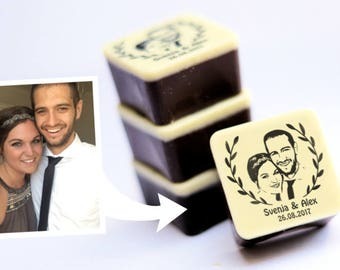 On request, a small magnet can be attached to the back of the tree disk-so your guests can use the individually engraved tree slices as a fridge magnet and always have a nice reminder of your celebration. The Astscheiben have a width of approx. 5-7 cm. This is a natural product. Width and height vary. Please select the desired number when ordering-scale prices see drop-down menu "number"
Minimum order quantity: 30 pieces. You want to convince yourself of the quality before ordering? Then Firstonce ordered a sample name card. But beware: The pattern is not personalizable, i.e. the name and design of the sample is not to be chosen!! Wunderschön gemacht, schnell geliefert! Vielen Dank! Die Pralinen sehen sehr schön aus und schmecken lecker. Welche Fotos eignen sich für einen Fotostempel, Fotowindlicht etc.? Eure Gesichter sollten gut ausgeleuchtet und nicht teilweise im Schatten liegen. Günstig sind auch oftmals Frontalbilder und nicht Bilder wo die Kamera von unten oder oben auf die Köpfe herabblickt. Auch sollten die Bilder nicht verwackelt sein und eine gute Auflösung haben, also nicht verpixelt sein. Als kleiner Richtwert kann man die Dateigröße der Fotos nehmen. Die Fotos sollten min. 500 kB groß sein und zum Versenden nicht verkleinert werden.